This is the contents of my hoover. Don't switch off. Let me explain. During my last module, I began investigating the concept of time; how we percieve it and the different types of time that effect our world. I wanted to continue this exploration in my Final Major Project, and produce a range of products that correspond to my Learning Agreement..
Functional objects that reflect the human condition; playing on our perceptions of time, ageing and religion through domestic products. To develop a product alongside my LED Sundial, but without infringing on it, I decided to look again at the philosophies about time and our connections with the natural world. The German phenomenologist, Martin Heidegger (as quoted in The Spell of the Sensuous), describes the concept of the present as "usually represented in the sense of a succession of a calculable sequence of nows." These 'nows' chart a linear progression of time; this linear time that feels so inevitably finite, and what prompted my study into the more spiritual, uplifting circular time for the development of the LED Sundial. I began looking at the way we define our time. When does the present become the past? How do we measure our time? David Abram's The Spell of the Sensuous has become a pivitol book in my exploration into time and the natural world. It details and debates some of the most interesting philosophies around the subject, and highlighted for me the inherent connection between space and time - or rather place and time. Space-time is now a widely regarded scientific theory, but the abstract philosophies behind it can be extrapolated to expand our understanding of the past and memories. The theory states that the place that an event occured in is intrincically important to the event; when you remember a memory, you can frequently pin point the exact place it happened, not just by location but by your connection to that environment through your senses. I started to consider our past environments and how they are preserved. How could we measure the progression of our present to our past and take our environment into account? It was at that point that I started thinking about dust. Dust is all around us, whether we like it or not. Contrary to popular belief, only a small percentage of house dust is made us of human skin; most of it is hair, soil, air pollution particles and fibre from textiles including your clothing, your carpet and your curtains. In my family home we have a lot of pets, including some very large dogs who shed a lot of hair. Even the most diligent cleaner can't avoid the inevitable build up of dog hair behind the washing machine and under the fridge. Months or years after a pet passes away, you'll suddenly decide to sweep under the fridge and lo and behold, a wad of molted pet hair appears at your feet and your memories about your beloved deceased pet all come flooding back to you. 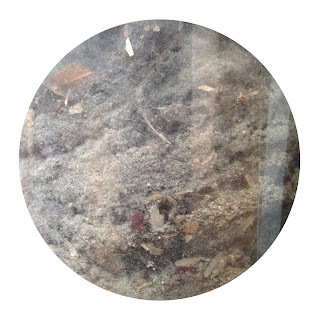 Dust is the forgotten fibres of your wooly jumper; it's the pine needles from that Christmas tree that you didn't get rid of until it had turned thoroughly crispy; it's the brick powder that the builders covered the house in when you had your kitchen done. It falls as a linear memory of the past from our environments. Like a living sedimentary rock, it embodies our environment as a corporeal fossil.